Food, Family, Fun. : Vegetarian lunch - no sandwich! Yummy looking lunch! We love hummus too! 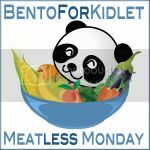 Thanks for linking up to Meatless Monday!